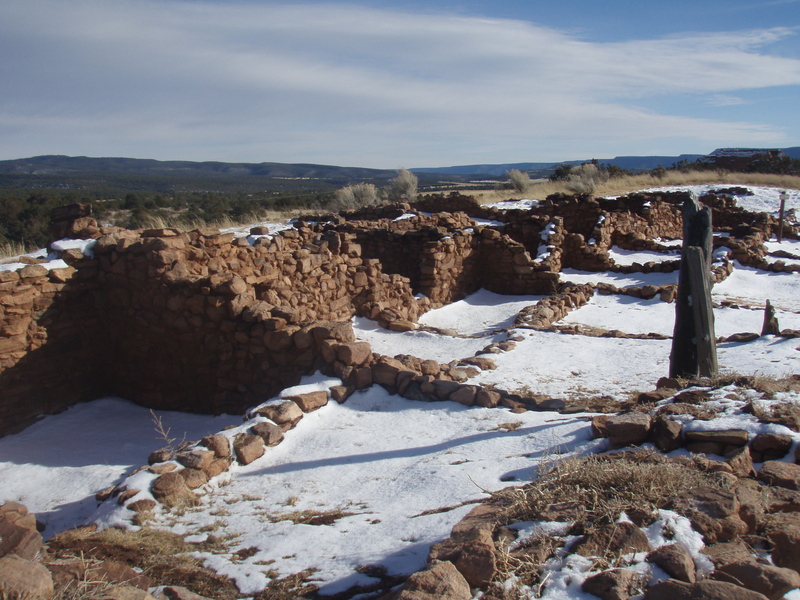 Yesterday, I went out to Pecos National Monument and studied the Pecos Pueblo Indians, the Church missions, the Spanish invasion, and the Pueblo Revolt. The site is on the southwestern edge of the Great Plains that extend up to Missouri. Paleo-Indians traveled these plains as early as 5500 BC hunting Buffalo. 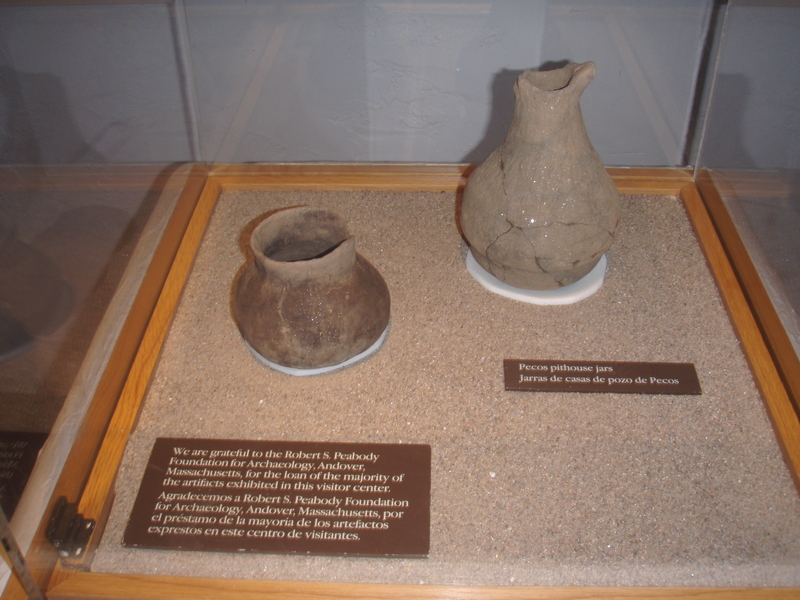 From about 700 AD there is evidence of pithouse settlements that grew corn, made baskets and some clay containers, and traveled or traded shells from the Pacific ocean. About 50 miles to the northwest, an obsidian quarry is located (an excellent source of arrow heads). With crop domestication, Pecos became a trading post for plains Indians and, also much later (post 1820) for settlers traveling on the Santa Fe trail. 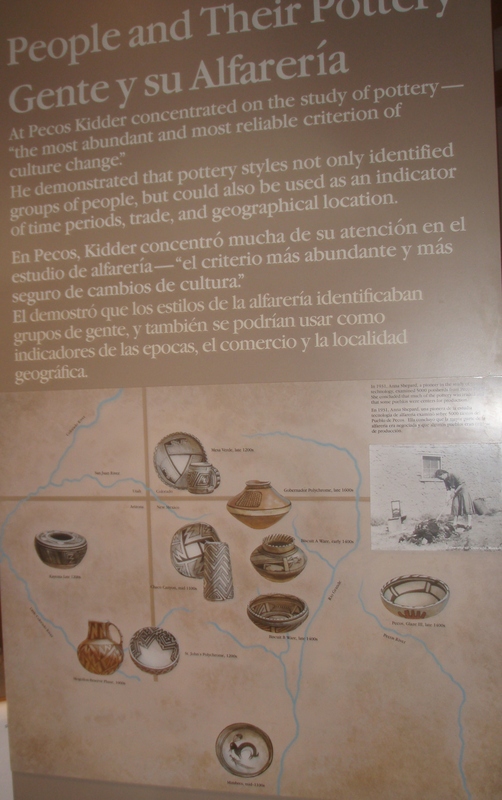 About 1100 AD, the first Pueblo settlements are evident with apartment style living, crop domestication, and sophisticated glazed ceramic pottery. They also had music, art, religious objects, and smoking pipes. Arrows, drills, and hatchets were constructed from stone. In 1541, Coronado led the first Spanish contact with the area. 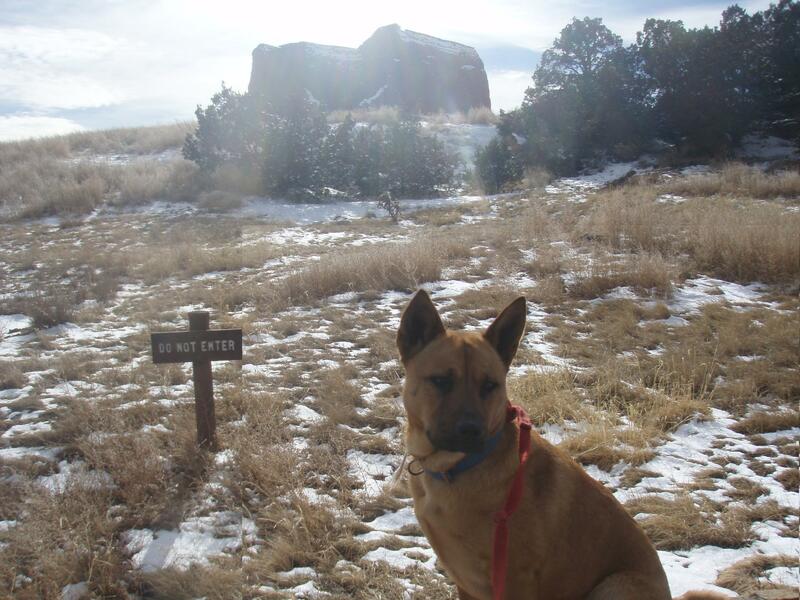 He initially approached the Zuni pueblo 150 miles to the west, and with a less than warm reception, proceeded to engage them. According to the movie, Those Who Came Before, that I saw today, the pueblo Indians were outstanding runners and were used to running long distances. Anthropologists estimate that news of what had happened to the Zunis arrived at Pecos by the next day. In any event, Coronado was wounded at Cibola (the Zuni engagement), but well received by almost every other pueblo after taking the Zuni pueblo. Arriving at the Pecos Pueblo, he was looking for one of the 7 golden cities, and a captive plains Indian told him there was one named Quivera in Kansas. Coronado was lured onto the plains as far as the Arkansas river and then northward up to Kansas and Southern Nebraska where he was ambushed for his goods. The Indian dubbed El Turko because of his headdress confessed to lying and met his demise. By 1598, the area was seized as a part of New Spain for the king of Spain. The first Spanish settlement was established in the area. Everyone seemingly answered to the Spanish king under one of 2 systems – a) a land grant encomiendas where goods were exchanged in return for military support, or b) a repartimiento that drafted Indians to work on Spanish farms for little compensation. With the Spanish, came the Church. Franciscan priests were ministering in the pueblo communities (some of them having walked from Mexico to Kansas) and attempting to convert the indians. 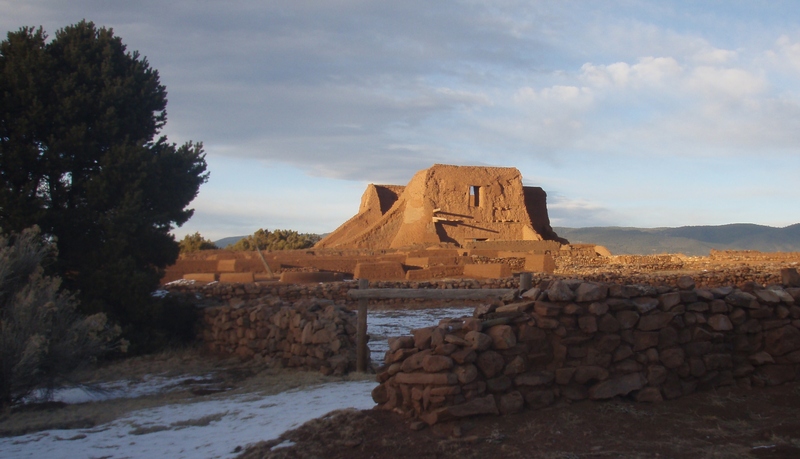 By 1625, they had built a huge church and mission next to the Pecos pueblo which had grown to about 2000 people. The Pueblo Indians, suffered from drought, famine, diseases brought by the Spanish, and religious persecution as well as social and economic oppression. Many of them organized and revolted in a massive collective action called the Pueblo Revolt or Popé’s Revolt of 1680. The Spanish were killed; their churches, sites, and priests destroyed. Popé, the Indian who organized and led the revolt, was quite the hero (and there is apparently a statue of him in the US Capitol). Pueblo Indians retook Santa Fe, and when Vargas returned, the rebellion was thoroughly quenched, and the Indians dispersed. In the 18th century, a smaller version of the church was rebuilt over the 17th century church ruins. Spin waiting at the altar in the new reconstructed church. What a handsome one!!! 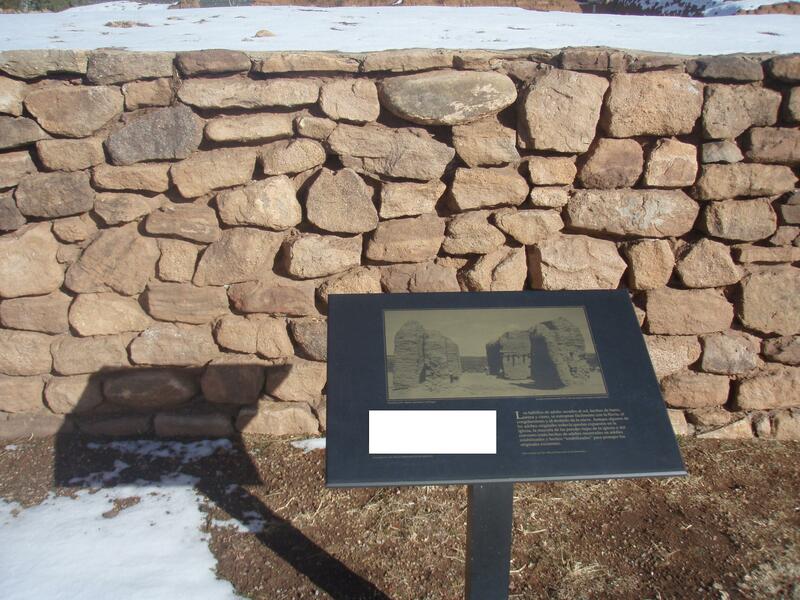 The Pecos site is notable for the fact that it was really a pioneering site for the field of archeology. 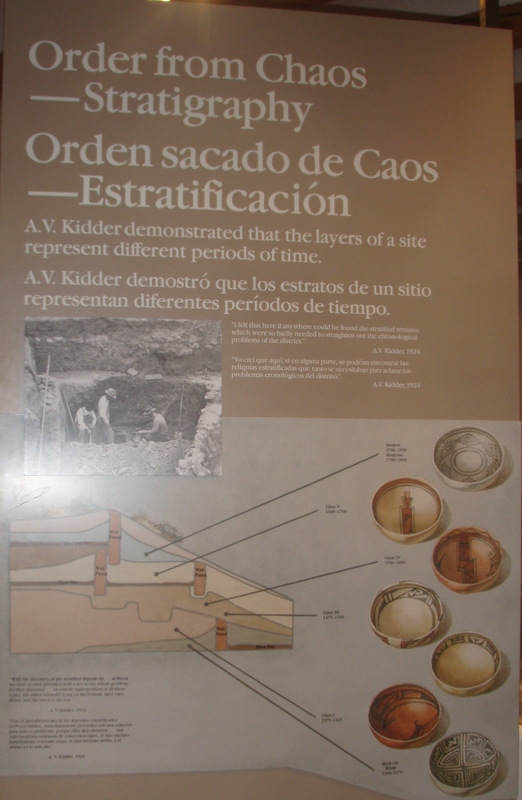 The trash dump was one of the first sites used to develop a systematic classification of Southwestern sites using field dating of levels – one of the first stratigraphic excavations of a site on a grand scale (1915-24). Many Southwestern archeology conferences are held at this site. I had tried to approach an archeologist in El Paso on my trip up to see if I could get some field work out on a site, learn a little about the trade. A little naïve, I suppose…It would have been a nice lark – but you probably have to have a Ph.D. in the field before they would let you anywhere near a dig (although there are some reports of amateur camps in Colorado). And the Indians for the most part don’t want people digging their sites. So, learning a little in a different way. 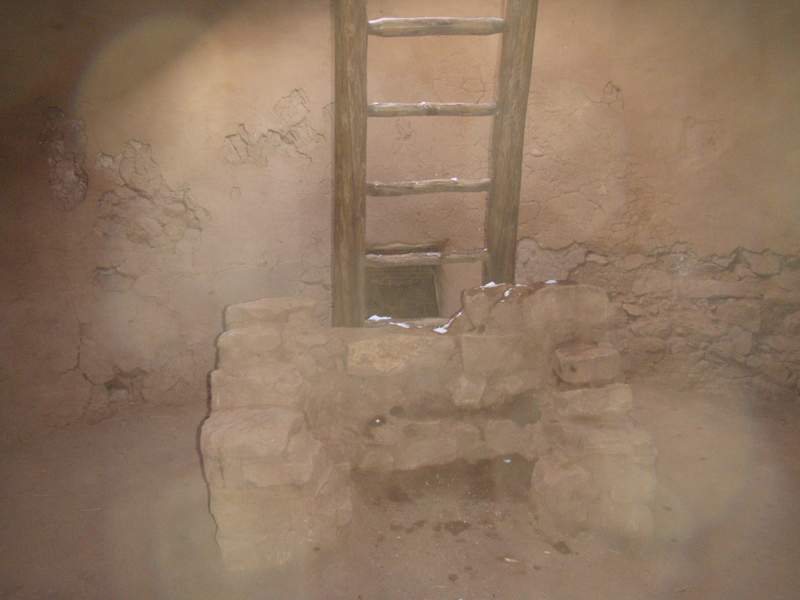 The sun dried adobe bricks, built with mud, ?, and hay deteriorate rapidly with the rain, freezing temperature, and the melting of snow. 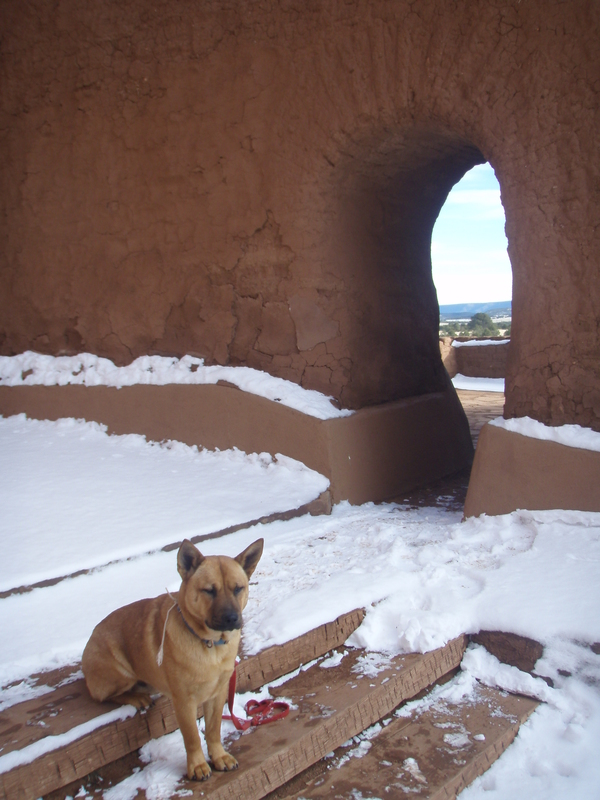 While some of the original adobes remain to this day in the church, the majority of the lower walls of the church and the convent are built with adobe surrounded by reinforcing adobe brick to protect the existing originals. 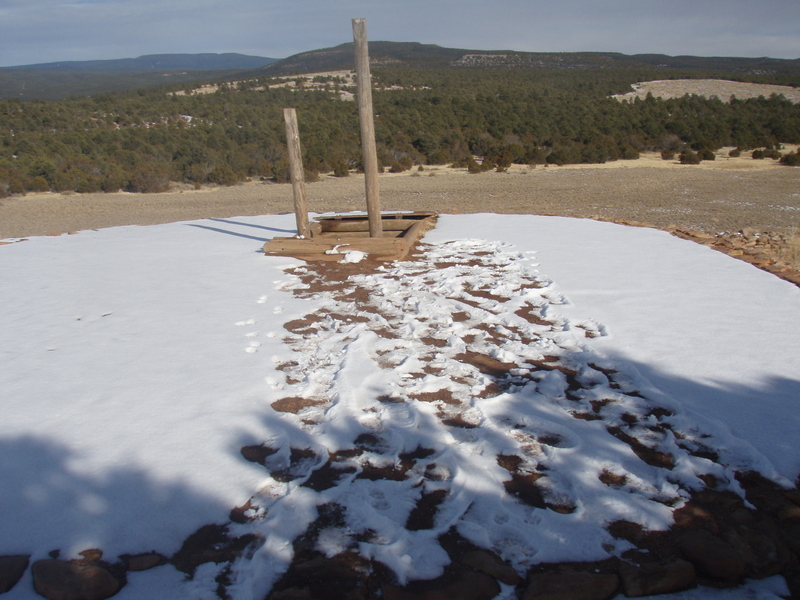 Sun dried adobe bricks, made of clay, sand and silt, are easily damaged by rain and the freezing and thawing of snow. Even though some original adobes still remain exposed in the church, most of the low walls of the church and convento are encased in newly made “stabilized” adobes to protect the originals. It was one of the colder days with the wind. 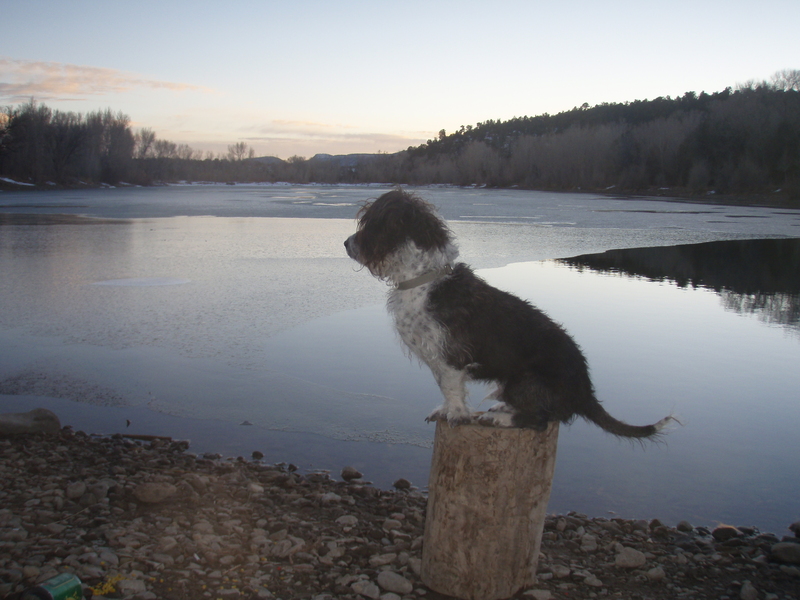 After running the dogs at the Santa Fe outdoor park around lunch, I kept them in the truck for most of the day, letting them out at the end for a romp in the woods around a frozen monastery (Benedictine) lake. 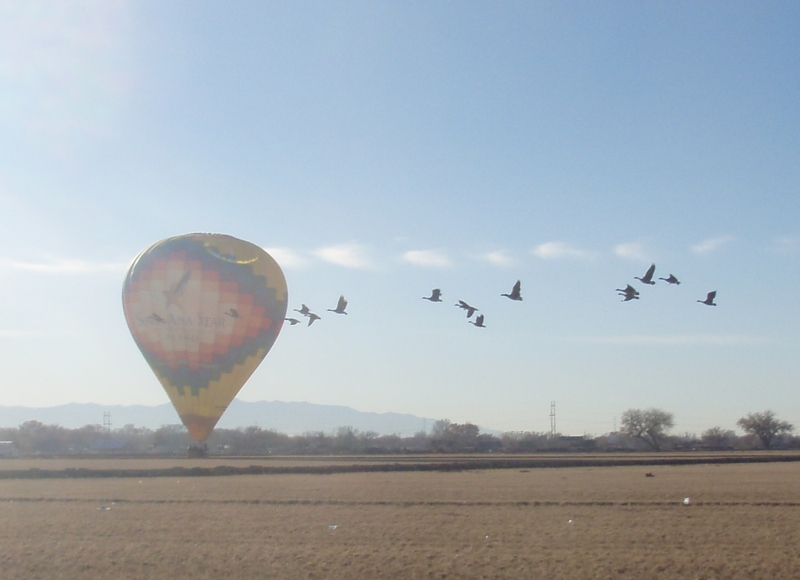 I woke up this morning to a hot air balloon descending in the adjacent field full of 500 snow geese. They had also apparently migrated for the winter. Although, according to this site, no vagrants are apparent in New Mexico.